The field and post positions were set on Wednesday afternoon for the Belmont Stakes (Grade 1), which will be run Saturday at Belmont Park in Elmont., N.Y. The race will not include Classic Empire, who likely would have been the favorite based in part on his second-place finish in the Preakness (Grade 1) on May 20. On Wednesday morning, Classic Empire’s trainer Mark Casse said the colt will not run on Saturday because of a hoof abscess. With Classic Empire out, Belmont linemakers made Irish War Cry the morning line favorite at 7-2. Those are the odds they expect the actual odds will be for the race. 1 1/8-mile Wood Memorial (Grade 2) at Aqueduct. 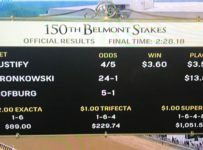 He finished tenth in the 1 1¼ mile Kentucky Derby (Grade 1) on May 6 at Churchill Downs in Louisville and did not run in the 1 3/16 mile Preakness at Pimlico. Always Dreaming, winner of the Kentucky Derby, and Cloud Computing, winner of the Preakness, are not running in the Belmont. 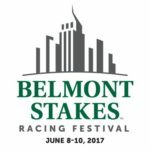 The Belmont will be the 11h race on Belmont Park’s Saturday card. Scheduled post is 6:37 p.m. The Belmont Stakes field is listed below with post positions, names, trainers, jockeys and morning line odds.